Here I am, on a slow day at Apple Falls, restocking and dusting the shelves when Colin bursts into the store. “Here we go”, I think to myself. I try to image what crazy adventure he has concocted for us as he walks in with a jar of what looks like earwax in one hand and a small apple tree in the other. He stands there grinning at me with his arms extended outwards, it’s as if I should already know what he’s doing. Cool. I don’t know what either of those things are but I’m instantly intrigued. Colin tells me we can go pick out any branch from any tree in the entire orchard and make a new tree with that exact same variety. “It’s a little bit of surgery, science and a touch of magic.” he says. “No.” Amelia responds, without hesitation. “You have work to do here. I’m tired of you and my dad going off on adventures while I have to stay here and do all the work!” This is classic Amelia, and I was expecting this answer. “Pardon me?” I say, “I’m sorry I got lost in your beautiful eyes and totally zoned out. Did you know you have the most fascinating eye colour? It’s the perfect mix of green and blue that seems to change it’s shade every day. If I get to see those eyes every day for the rest of my life then I will die a happy man. What were you saying, Amelia?” Usually one compliment like this and I have her in the palm of my hand. I run over to Colin, he gives me a big high-five and says, “Now let’s go find us a tree!” As we enter the orchard, I start to realize what a monumental task this will be. Everyone knows there are 12 acres of 26 different varieties of apples on Campbell’s Orchards. Little did I know, we wouldn’t just be searching for apple trees. We would be going on a grand tour of all the most important trees from around the farm. 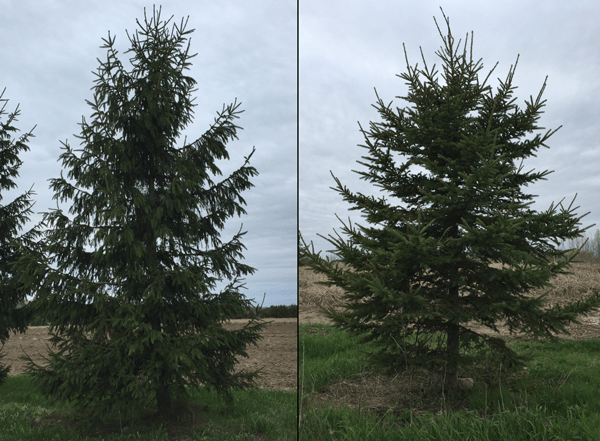 The Nordic spruce on the left and the White spruce on the right. As we walked deeper into the orchard I noticed a different looking tree. It was the only one in sight. “What kind of tree is that, Colin? It has such an interesting bark.” I asked. The oldest Birch tree in PEC. I gaped at Colin, struck by his immense pool of knowledge. How can one man know so much? “So, Birch trees must be able to survive in direct sunlight?” I asked timidly. I looked at him in disbelief and his eyes twinkled with mischief. He quickly took my hand and dragged me to our next tree. This was a large tree that looked old and wise. When I first looked at it I thought it was two trees growing close together, but when I followed the second tree’s trunk down to the ground, I noticed it was actually a massive branch coming off the main tree. “That’s the strangest looking branch I’ve ever seen!” I exclaimed. It really was. With all this new knowledge, my brain was starting to feel like an over-inflated balloon. Weren’t we trying to find an apple tree? With every new tree Colin wanted to show me, we got further away from the orchard. The Sugar Maple display the impressive effect of phototropism. After a long trip to many more trees, including a magnificent Hickory tree where I learned some interesting facts about the Indigenous Peoples of Canada. Did you know that they used to plant Hickory trees along their nomadic routes? Me neither. The First Nations would use the nuts as a food source when hunting was unsuccessful and because the wood is extremely strong it was used for all sorts of applications, including the very first lacrosse sticks. Finally, we arrived back at the very front of the orchard where these special apple trees were waiting. Colin took me to a knotty apple tree near the Heritage McIntosh grove. “This is a Rhode Island Greening tree and is the only one in the entire orchard.” Colin explained. “The Greening apple is crisp, juicy, tart and would be great in cider! It’s known for hanging on the branches well into the winter.” He pulled his pruners out of his pocket and flourished them in front of me. The metal blades glistened in the sunlight blinding me for a moment. I blinked and the tree was perfectly pruned. Colin was standing there presenting me with our target branch in his hands. We collected the branches and Colin led me back to the store where Amelia and the root-stock was waiting. “What took you guys so long? !” Amelia barked at us, her voice thick with indignation. Uh oh, I had completely lost track of time and judging by the position of the sun it had been no less than six hours since we had first embarked on our journey. “You LEFT me here all ALONE and there was like a hun–” I quickly pulled out some wildflowers I had picked on my adventure with Colin. Amelia was completely transfixed by them. Flowers are her weakness; she grabbed them and left us to find a vase and some water. Colin took out his pruners once more and placed them around the trunk of the small tree. I started to panic, it looked as if he was about to decapitate the innocent tree. Just as I was about to reach out to stop him, Colin squeezed the pruners together and top of the tree fell over with a sickening snap. I stared at him in shock, “What have you done! Are you crazy? !” I screamed at him. My voice was shaking in anger and emotion. He ignored me and picked up the Greening branch we spent all day trying to find. I froze in fear as he took out a knife, it’s blade flashed in the moonlight. He raised his hand and brought it down in a swift arc. I closed my eyes accepting the inevitable, but when I opened them I noticed the end of the Greening branch had been shaved off each side to make a thin, flat point. Next he made a small incision splitting the trunk of the tree down the middle. This was almost too much for me to bear and I started to feel the room spin around me. Just then, Colin looked up at me and handed me the branch and what was left of the tree. “Now we will create a new tree using both the branch and the root stock.” Colin said. I was completely taken aback. I assumed Colin was torturing this innocent seedling, but he was actually preparing it for a new life. “The Greening branch will act as a new tree and this root stock will provide it with the nutrients it needs to grow.” Colin explained, the smile had returned to his face. I took the tree branch and carefully inserted it into the slot he had made in the base of the tree. Colin then covered the tree with the grafting wax to protect it from exposure of the elements. “What is this stuff?” I asked. “This wax is made from over 67 different ingredients, most come from plants that are now either extinct or illegal. But some other ingredients include beeswax and mutton tallow.” he said. 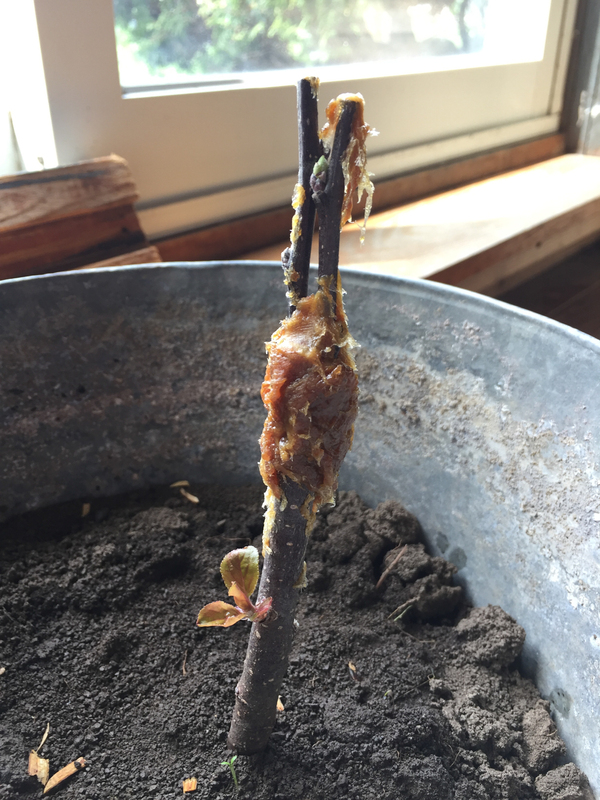 Our new tree was covered in wax and freshly potted in some dark loamy soil. We both stared at the tree, proud of what we had accomplished. “So how long do we have to wait for an apple?” I asked. I couldn’t wait to reap the rewards for our long day of labour. “If we’re lucky, about five years.” Colin replied. What?! Five years? I was hoping to have an apple by at least next weekend. I guess I have a lot of waiting to do. Be sure to follow us on instagram (@applefallscider) where I will be posting more facts about the other trees we visited as well as updates on the baby Greening tree.